The dairy aisle has never had so many yogurt options. Find out what each form of this ancient food has to offer the modern fit-conscious consumer! In many ways, a bowl of yogurt is a near-perfect snack for fitness fanatics. It has clearly passed the test of time, having been first consumed somewhere between 9000-6000 BC. This ancient food is created by fermenting milk with a starter culture containing lactic acid-producing bacteria, such as Lactobacillus bulgaricus. When fully fermented, each spoonful of yogurt offers up muscle-building protein, bone-benefiting calcium, and lots of probiotics—beneficial microorganisms thought to have a positive impact on your digestion and immune system. Not that humans a few millennia ago had to worry about this, but a 2017 investigation published in The American Journal of Clinical Nutrition found that yogurt can reduce the risk of developing type 2 diabetes. Yogurt, especially full-fat versions, has also been found to be an excellent source of vitamin K, a vital nutrient most often associated with plant foods like leafy greens. The only problem with yogurt is that there are so many kinds of it to choose from these days. Once upon a time, yogurt was yogurt. Now we have yogurt, Greek yogurt, skyr, kefir, and other varieties from specific countries and cultures. Then there are yogurt smoothies, as well as yogurt made from cow's milk, goat's milk, sheep's milk, soy, coconut, and almonds. The mind reels at the variety. To help you better navigate the dairy aisle, here are the pros and cons of six yogurt products that can add some culture to your diet. Skyr is an ultra-thick, velvety dairy considered a cheese in its home country of Iceland. In the United States, it's marketed as yogurt. Made by fermenting skim milk with cultures then straining away the liquid, skyr provides densely concentrated protein without any fat calories. In fact, skyr can have even more protein than Greek-style yogurt: about 17 grams in a 150-gram container. That makes this healthy import your muscles' BFF—and may also help you feel full for longer. 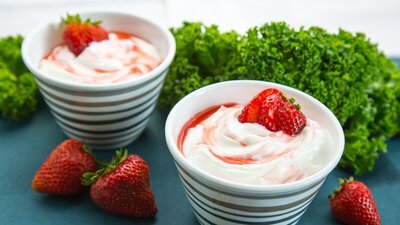 A study published in Nutrition Journal found that healthy women who consumed a high-protein yogurt for an afternoon snack experienced less hunger and consumed fewer calories at dinner than when they snacked on the same number of calories in the form of chocolate or crackers. The straining process skyr undergoes also removes much of the lactose, which may make this kind of yogurt easier for sensitive stomachs to digest. To keep your sugar intake in check, opt for plain skyr, which has 50-75 percent less sugar than fruit versions. But to be fair, most skyr producers, like Siggi's and Icelandic Provisions, place real fruit before sugar in their ingredient lists, a reversal of the order normally found in fruit-flavored regular and Greek yogurts. Kefir: Not All Varieties Are Up to Snuff! Growing interest in the role probiotics may play in digestive and immune health has made kefir a rising star of the dairy section. Made first in the Caucasus Mountain region of Russia, kefir is made by inoculating milk with a colony of bacteria and yeast called "kefir grains." Kefir (pronounced kuh-FEAR) has an even greater number and diversity of microorganisms than does traditional yogurt, which explains why unflavored kefirs have such a pucker-inducing tartness. The large numbers and types of bacteria in kefir do a very good job of breaking down lactose, making kefir easier to digest—even for some people with lactose intolerance. Other nutritional benefits including notable amounts of protein, at roughly 11 grams in a cup serving, as well as calcium and hard-to-get vitamin D.
Kefir is sold both in tubs with a consistency similar to that of regular yogurt or, more commonly, as a thinner beverage that can be poured into a glass. Try the latter in pancake or waffle batter, poured over a bowl of cereal, or added to protein shakes. Kefir is available in both low-fat and full-fat varieties. Choose the one that best suits your dietary preferences. But be warned: Much of the so-called kefir sold in the United States has become little more than a delivery system for sugar. As with all types of yogurt, it's better to skip all the sweetened varieties and choose plain versions. Read labels before you buy anything! Drinkable Yogurt: Watch That Sugar! With so many people eating on the run, it was just a matter of time before food companies started producing drinkable yogurts. Pull a bottle of it from the fridge and chug your yogurt on the drive to work: No bowl or spoon required. Also marketed as yogurt smoothies, manufacturers employ techniques that make the yogurt more like buttermilk in consistency. A peek at labels suggests drinkable yogurts can offer up many of the same nutritional perks as traditional yogurt, including about 10 grams of protein per cup, along with bone-building calcium, B vitamins, and strains of gut-friendly probiotic cultures. But drinkable yogurt might not be so strong in the appetite-suppressing column. You might be scouring the pantry for more food sooner after drinking your yogurt than you would after spooning it up from a bowl. It's also a challenge to find plain versions of drinkable yogurt and many flavored versions are full of sugar. If you're not careful, you could easily drink upward of 40 grams of sugar in one serving. If you can't find plain drinkable yogurt at your local store, choose a flavored brand like Siggi's. An 8-ounce serving delivers no more than 20 grams of sugar, 10-12 grams of which is naturally occurring dairy sugar. Siggi's yogurt varieties typically list real fruit before sugar. If you just can't bear to eat plain yogurt, eat the flavored varieties post-workout, when sugary carbs are less likely to end up on your waistline. If you've ventured into a Middle Eastern grocery store or restaurant, you may have come across labneh, a thickened, spreadable dairy food made by straining cow's milk yogurt. It's similar in concept to Greek yogurt, only it's as thick as cream cheese. The tangy, creamy treat is free of added sugars, making it a great source of protein, vitamins, minerals, and probiotics. Protein-wise, it's usually right on par with Greek yogurt, but read labels to make sure. Instead of dumping labneh into a bowl and covering it with fruits and berries, spread it on toast in lieu of cream cheese or use it to dress sautéed greens. It also makes a great dip, seasoned with olive oil and middle eastern za'atar seasoning mix. It can also be used as a stand in for mayo when making tuna and potato salads. Line a strainer with a couple layers of cheesecloth. Set the strainer over a bowl deep enough that the bottom of the strainer is a few inches above the bottom of the bowl. Stir 1/4 teaspoon salt into 2 cups of plain full-fat yogurt (not Greek style) and place the yogurt in the lined strainer. Fold the ends of the cheesecloth over the yogurt and refrigerate for 12-24 hours. The longer the labneh sits, the thicker it gets. First it was your steak. Now your bowl of yogurt can hail from beasts fattened up on the pasture! A worthwhile splurge? Perhaps. There is some indication that milk from cows that are fed predominantly grass instead of grains and corn contains higher amounts of certain key nutrients, including vitamin E, iron, conjugated linoleic acid, and the much-heralded omega-3 fatty acids. However, to fully reap the nutritional benefits of grass-fed yogurt, you'll need to choose full-fat or 2-percent versions. The omega-3s and other beneficial fats are largely removed when the yogurt is transformed into the fat-free variety. For the time being, there's no strict government oversight regarding grass-fed labels on yogurt, so you want to look for brands that clearly state "100% grass-fed" on their labels whenever possible. That's your assurance the yogurt hails from cows that are wholly grass-fed, rather than simply being served the occasional side dish of greens to go along with their grains. Now that manufacturers are able to implant plant-based milks like almond and coconut with cultures, vegans now have a constantly growing list of viable yogurt options. Many of the non-dairy products are fortified with calcium and vitamin D to better mimic the nutrition profile of dairy-based yogurt. But most of the nutrition in these substitutions is added to the product, rather than being inherent in it. And in some ways, they're still sorely lacking. First and foremost: These animal-milk-free yogurts often come up short when it comes to protein. Yogurt made from soymilk will provide the most protein per spoonful, while coconut-milk yogurt may only have a single gram of protein per serving. But this will vary widely by brand, so keep your label-reading skills honed. No matter what kind of dairy-free yogurt you choose, you'll still likely get a whole lot of added sugar when you eat them, even if you choose the plain varieties. If you're spooning up these faux yogurts, just make sure to cut back on sugars elsewhere in your diet. Guasch-Ferré, M., Becerra-Tomás, N., Ruiz-Canela, M., Corella, D., Schröder, H., Estruch, R., ... & Serra-Majem, L. (2017). Total and subtypes of dietary fat intake and risk of type 2 diabetes mellitus in the Prevención con Dieta Mediterránea (PREDIMED) study. The American Journal of Clinical Nutrition, 105(3), 723-735. Fu, X., Harshman, S. G., Shen, X., Haytowitz, D. B., Karl, J. P., Wolfe, B. E., & Booth, S. L. (2017). Multiple Vitamin K Forms Exist in Dairy Foods. Current Developments in Nutrition, cdn-117. Ortinau, L. C., Hoertel, H. A., Douglas, S. M., & Leidy, H. J. (2014). Effects of high-protein vs. high-fat snacks on appetite control, satiety, and eating initiation in healthy women. Nutrition Journal, 13(1), 97.